The Indus Motor Company (IMC) has now finally launched the Toyota Hilux Revo In Pakistan. The Toyota Hilux Revo launching ceremony was held in Karachi, yesterday. 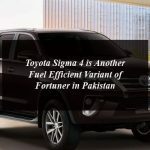 The Indus Motor Company has called the IMC (3S) dealership network for the official announcement of the Toyota Hilux model in Pakistani automobile market. The official availability and the Price of the Hilux Revo will be declared in the month of October, but its approximate price in Pakistan is between 3.5 to 4.5 million. The sources said that the new model of Toyota includes a 3.0L Turbocharged 1KD-FTV engine. The other features include Toyota’s autonomous emergency braking (AEB), Traction Control, Hill Assist Control, Downhill Assist Control, Vehicle Stability Control, 7 Airbags (Brake Assist, Trailer Sway Control, curtain airbags ,dual front airbags, chest airbags, and driver knee airbag) and many more.